Writer Matt Sturges's JSA All-Stars: Glory Days both confirms and rejects my assertion, after reading the previous volume Constellations, that JSA All-Stars is really just a new iteration of the classic Infinity, Inc. team. Plot-wise, there isn't much remarkable in Glory Days, but fans of the team's roots will find a bit to enjoy nonetheless. It isn't just that members of the JSA All-Stars team reminisce about their Infinity, Inc. days. It's isn't just that the book cameos another former Infinity, Inc. member, or that it picks up the threads of an Infinity, Inc. story. It's about the time that members of the JSA All-Stars actually drive by the old Infinity, Inc. headquarters and stop to take a look that it becomes impossible to deny how much the ghosts of that former team drive this book. Sturges begins the "Glory Days" story in Infinity, Inc.'s home base, Los Angeles as the team helps out former Infinity, Inc. supporting cast member Chief Bracken; this leads Infinitors Hourman and Atom Smasher to joke about the old days, all in the first six pages of the story. The connections grow exponentially from there. The stated message of "Glory Days," however, is that one can't regain the past. A group of telepathic children transformed into gods remain these gods in the end; the All-Stars can stop their rampage, but can't turn back the changes of time. Just so, the old Infinity, Inc. headquarters has been condemned and is demolished in the end; to defeat the gods, the All-Stars have to let go of an element of their past, including Atom Smasher acknowledging that Infinity, Inc. is "history." To take Glory Days at face value, perhaps Sturges does mean to bury the connections between the All-Stars and Infinity, Inc. Between Atom Smasher letting his past go, the final image of the demolition of the old headquarters, and Infinitor Brainwave turning down membership in the All-Stars, there's no knowing wink at the end of the book that suggests an ironic valuation of the past; rather, Sturges seems to suggest, the past is past. Perhaps this benefits Sturges; if despite having four former Infinitors in lead roles in All-Stars (making this the Justice Society equivalent of Cyborg leading the Infinite Crisis-era Teen Titans), Sturges meant to separate his All-Stars from Infinity, Inc., then making those ties explicit and subsequently putting them to rest might be the way to do it. I can't, however, entirely believe it. It would seem to me there's plenty of potential in Sturges's Infinity, Inc. sequel, including guest-appearances by the newly resurrected Jade (who gets a mention in this book) and her brother Obsidian, another appearance by Brainwave, maybe more about Fury and Silver Scarab (the modern Justice Society's long-time Dr. Fate) who died toward the end of the JSA title. 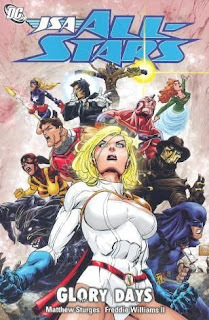 Much as I'd like to evaluate Glory Days on its own merits, whether Sturges is serious about jettisoning this book's Infinity connections could best be determined by the amount of Infinity material in the book that followed; sadly, DC cancelled the JSA All-Stars: The Puzzle Men trade and solicits for the subsequent issues reveal few clues. Sturges sandwiches the four-issue "Glory Days" between a single issue spotlighting the character Damage, and two issues on the character Cyclone. Damage, one of my favorite teen heroes from the 1990s, gained a heavy dose of attitude under writer Geoff Johns; I've long been torn between happiness that Johns used the character and disappointment at what an angst-ridden grouch he made Damage. Damage's romance with Judomaster never quite made sense (he liked her, it seemed, for her body, and why she responded to him I'm not sure); in the memorial issue, Sturges both forwards their relationship a bit and tweaks things such that the usually-mute Judomaster can talk about it. These are obvious narrative devices both, but I liked that Sturges gave Damage some due respect and even revealed the characters' face, and all-in-all I was satisfied. The Cyclone issues ("Yon Twelve-Winded Sky," with art by JLA's Howard Porter) were interesting, though I wished for just a little bit more. Sturges does well with a heavy science-fiction vibe in the story, both in fascinating presentations of nanobytes and cloning in regards to Cyclone, and his blink-and-you'll-miss-it cut scenes as the All-Stars fight in an alien revolution (I was reminded, if you can believe it, of the New Titans's "Siege of the Zi Charam*"). But I've understood for a while that Cyclone Maxine Hunkel was actually a robot -- maybe I misunderstood something Red Tornado said once -- and I was hoping we'd get into her origins in depth in this story. Instead, "Twelve" puts everything essentially back where it started; it is a good enough story to "end" JSA All-Stars, at least for collections fans, but didn't quite live up to my (perhaps erroneous) expectations. There and elsewhere, it's true not much happens in Glory Days. The memorial issue is mostly reflective, "Twelve" doesn't change much, and "Glory Days" is not really about the All-Stars -- they have to face their pasts, sure, but the bad guys have no real ties to the All-Stars specifically, unlike in Constellations. Indeed, Sturges never quite explains how the Paradorian dictator actually turns the telepathic children into gods, for instance; the plot here is less important than the characters' interactions. There's nothing wrong with that, per se -- at times it's even welcome -- but if you don't have a soft spot for these particular characters' "glory days," you may very well feel like JSA All-Stars: Glory Days doesn't do enough to distinguish itself. In the end, between Constellations and Glory Days, I enjoyed the two volumes of JSA All-Stars more than I thought I would, and the series has certainly cemented my appreciation for Matt Sturges -- an obvious Infinity, Inc. fan, to this extent, is not to be overlooked. Had I to choose between JSA All-Stars and other similarly cancelled series for resurrection, like Doom Patrol and REBELS, I think I'd still side with Doom Patrol, but JSA All-Stars has plenty going for it, too. Later this week ... Collected Editions's Best Trades of 2011 List, and the Green Lanterns go to war. Be here! * I miss Jarras Minion. Does anyone else miss Jarras Minion?